The time course of nitrate production is different in different soils; in some soils, nitrate is produced at a constant rate while in others, this rate increases with time, often exponentially. Mechanistic models, based on the Monod equations, cannot account for a constant rate of nitrification. All such mechanistic models make the implicit assumption that the nitrifying organisms are distributed uniformly as single cells throughout the soil volume, while in reality, the cells might be expected to occur in small clusters formed by repeated cell division. This paper examines the effects of allowing the ammonium oxidising cells to occur in evenly distributed clusters of cells of equal volume. One effect of clustering would be the lowering of soil pH around the cluster, caused by differences in the rates of acid production and diffusion. The effects of this pH depression were examined using a mathematical model. In general, it was found that the effect of clustering was to reduce the rate of ammonium oxidation. In extreme cases, in which the fraction of the soil volume occupied by the cells was assumed to be small, the model predicted a constant rate of ammonium oxidation with time in contrast to the increasing rate with time predicted by a model based on a uniform single cell distribution. The clustering model was therefore capable of reproducing the different time courses of ammonium oxidation reported in the literature. 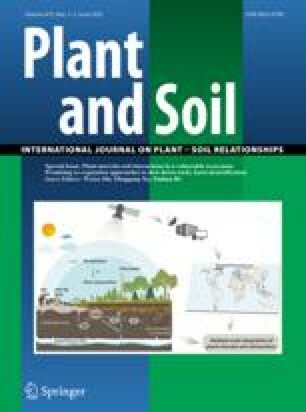 The differences between the time courses of ammonium oxidation predicted using the two different assumptions was affected by the initial pH of the soil. This observation suggested a possible experimental test of the clustering hypothesis.